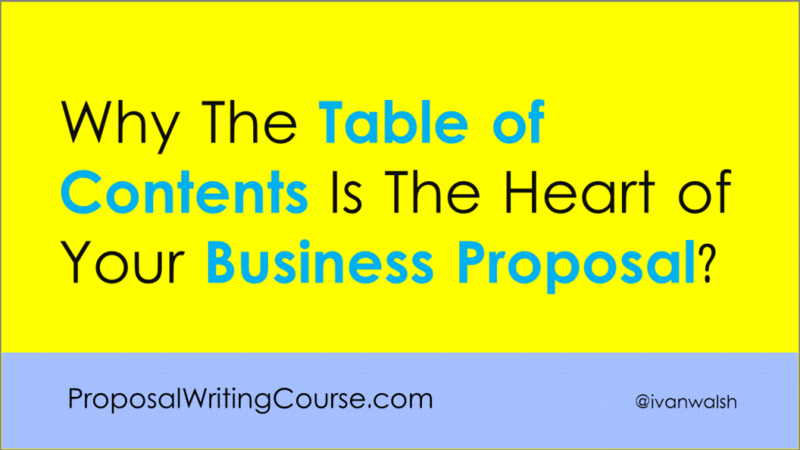 You are here: Home / Planning / Why The Table of Contents Is The Heart of Your Business Proposal? This is Part 1 of a 20 part series on writing Business Proposals. What we’ll look in this course is how to get started, format the proposal, and submit it. Once we’ve done this, we’ll look at how to improve your chances of getting the bid accepted, for example, by giving presentations to the Assessors. I’ll also show you how to improve your business writing techniques. And before you say I HATE GRAMMAR, I can guarantee you it’s not about grammar. Ok, some parts will be, but they’ll be painless. Instead I’ll show you how to use psychological tricks to get into the reviewers mind. To close the gap between what they need and what you offer. It’s very interesting. If you want to stay one step ahead of me, read Chip and Dan Heath’s Switch. That will get you started. There are different types of business proposals. Each type has its own requirements. In this course, I’ll look at how to write a consultancy proposal and how to avoid the most common mistakes proposal writers make. For example, this will be of use to government agencies or other bodies that want to procure the services of a consultancy firm, such as an advertising agency, Public Relations or Recruitment firm or another type of company that provides specialist services. To get started, I will create a table of contents for each of the main sections and then drill-down into each sub-section. That’s it for today. No homework! You get the weekend off.